Long blooming, dramatic, and bold. It's a wonderful rich deep yellow iris with falls banded nearly an inch thick in a airbrushed brownish-red. A white zonal spot highlights the bright orange gold beards. Stalks are strong, of moderate height, with good branching, amazing coloured buds. Fred Kerr suggests 'Bold Vision' is a zonal variegata, Perry Dyer suggests it is a Emma Cook Pattern. I just think its a ray of sunshine. Contemporary Views, 2003-2004, Perry Dyer– Emma Cook Pattern. 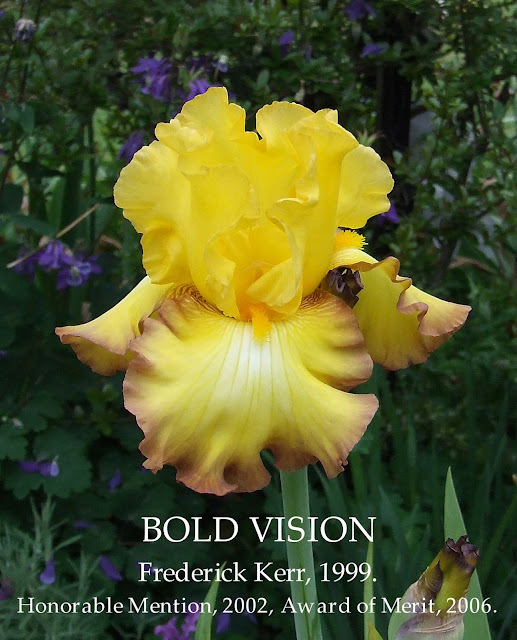 BOLD VISION (Kerr 2000) is from the same hybridizer which gave us another Emma Cook type, ‘Queen’s Circle’, but the pattern is the only thing that is similar. Color combination, instead, is rich yellow standards and falls, then precisely banded in bold brown-red. Yellow beards blend in to the base color. A nice advancement over an earlier Emma Cook type introduction from Fred, ‘Dear Jean’, with richer color and more elegant banding. It is finally receiving the recognition it deserves. Fred Kerr's, Rainbow Acres, North Highlands, California. BOLD VISION Frederick Kerr, Reg 1999. Sdlg. 936307. TB, 29" (74 cm), EML. S. dark yellow; F. dark yellow, lighter around gold beard, wide brownish red band; ruffled, flared. Citoyen' X 9111A, Dear Jean sib. Rainbow Acres 2000.